To haul a continuous longline with pegs out of the water, and strip the mussels off ropes. The hauler is a star-shaped device which allows for the passage of the pegged rope. It is made of stainless steel and is driven by a hydraulic pump OMP 400. It is set up in conjunction with the mussel stripper. The stripper detaches mussel from the rope and consists of a framework of tubes with hooks attached. The unit is mounted on a boat, usually in conjunction with other machinery (access ramp M-501, de-clumper/grader M-502, M-513, Spanish continuous socking machine M-514, M-515). Powered by a hydraulic pump, fitted to the boat's engine. It has a star-shaped wheel to pull the pegged rope. A roller to carry the longline overboard is installed at the bow. The access ramp has an incorporated vertical roller which is fitted to the ramp, and guides the longline out of the way. The ropes are pulled out of the water and up the ramp by the hydraulic hauler. The stripper pulls the mussels off the rope with its framework of tubes with hooks attached. There is space between the tubes to allow the mussels to drop through. 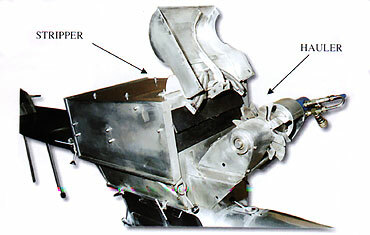 Mussels still attached to the rope are detached by rubber flaps as the rope emerges from the stripper. From the stripper the mussels are dropped into the de-clumper/grading machine. The mussels are sorted by the grader, and pass accordingly into the socking machine, to be fastened once more onto the longline as it passes over the bow. These machines can also be set up independently of one another. These machines are used in the continuous longlline method, which allows smaller boats, and quick and efficient work of deployment, Spanish continuous socking machine, and harvesting mussels. Once the socking process is complete, the ropes are covered by perfectly graded mussels, free of parasites, which promotes more uniform growth and an increase in the quality of the product. The machines are fairly low-tech, easy to install and use, and virtually maintenance free.